Reince Priebus, chairman of the Republican National Committee, said the party’s platform on gay marriage has not changed despite the massive effort spearheaded by the RNC to make the party more inclusive. “I know our party believes marriage is between one man and one woman,” Priebus told MSNBC’s Luke Russert on Wednesday morning. Priebus’ reiteration of the Republican Party’s view on marriage comes at a politically sensitive time. The RNC just released a major report detailing ways to modernize the party and make it more attractive to minority groups, including LGBT voters. Meanwhile, a Washington Post/ABC News poll released Monday showed support for gay marriage is at its highest level ever: Fifty-eight percent of Americans said they believe gay marriage should be legal. 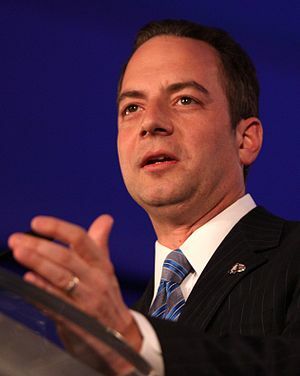 Read more Reince Priebus: Republican Party ‘Believes Marriage Is Between One Man And One Woman’. This entry was posted in News from the Soul Brother and tagged Columbus Dispatch, equality, gay marriage, Luke Russert, marriage equality, MSNBC, Ohio, Reince Priebus, republican, Republican National Committee, Rob Portman, United States. Bookmark the permalink.